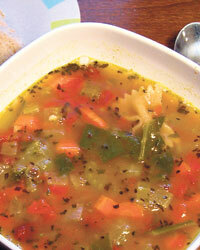 The minestrone is definitely one of my favourite soups. Packed with goodness and great flavour, this soup makes a great lunch or dinner – light, healthy and nutritious. You can enjoy it with some hot garlic bread or some whole wheat bread rolls. The stock is really the most important ingredient and forms the base of the soup. A little bacon in the stock add a great kick and a deep flavour to the soup. I like to trim the bacon and lightly sauté it without any extra fat since it has enough of its own! I then add this to the stock and let it simmer in it for a while so that its flavour permeates through the stock. Before adding the stock to the vegetables remove the bacon bits by straining it through. Ingredients: For soup: 3 tblsps olive oil; 2 medium onions, diced; 4 medium carrots, diced; 2 celery sticks, diced; 4 crushed garlic cloves; 3 fresh thyme sprigs or 1 tsp dried thyme; 2 fresh rosemary sprigs or 1 tsp dried rosemary; 1 leed, sliced; 1.5 litres hot vegetable stock; 400gms plum tomatoes, roughly chopped; 2 tblsp tomato puree; ½ cup red kidney beans, soaked over night; grated Parmesan to serve. For the Salsa Verde: 40 gms fresh parsley; a dash of vinegar (red or white); 2 garlic cloves, chopped finely; 100 ml olive oil; salt and pepper. Method: Heat the oil in a non stick pan over low heat. When hot add the onion, carrots celery, garlic, thyme and rosemary (if using fresh herbs) and sauté until softened. Add the leeks and cook till the leeks have softened. Then add the hot stock on top of the pan making sure that the vegetables are covered. Bring to the boil and simmer till the vegetables are cooked through. Stir in the chopped tomatoes, tomato puree and beans and cook till all the flavours are well blended and the beans are cooked through. If using fresh herbs, discard them now and season to taste. Meanwhile, make the salsa verde by putting all the ingredients in a food processor along with the salt and whiz. Keep aside. To serve, pour the soup in the soup bowls and top with some salsa verde and enjoy!